Determine not only the size of the room, but the furniture placement too. In general, allow 18 inches of exposed floor space around the perimeter of an area rug. Keep in mind that an undersized rug can make a room look small and and your furniture uncoordinated, so the overall size of the room should be considered. 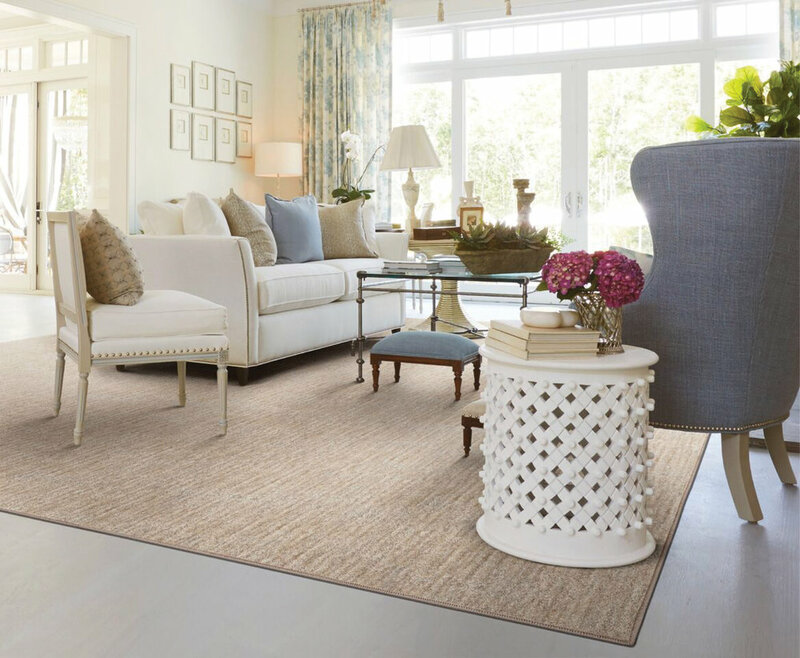 Here are three helpful tips to consider as you select your rug. If all furniture legs are off of the rug, pieces should all surround the edges. This is ideal when opting for a smaller rug. The most popular layout for living room furnishings is to have just the front legs on the outer edges of the rug. This arrangement will connect the furniture while creating a sense of proportion in the room. For a more polished look, put all of the legs of the couches and armchairs on the surface of an area rug. This Stanton Palermo Collection rug, Earth, with tone-on-tone banding, adds the cohesive element to this soothing guest room. There is a difference between a $200 and a $500 area rug which is usually seen in the thickness of the product. Also, whether wool, silk, flat woven, tufted, hooked, or synthetic fiber, and from hand-knotted to machine-made, the difference in fiber and manufacturer will affect durability. Ask advice from us—we are the experts! Have your rug pretreated with stain guard. Vacuum regularly, but don’t use the beater bar attachment. Use a rug pad for extra cushioning or when you are using your area rug on a non-static surface (on other carpets, on tile with large grout lines).